The Popular Republic of China (PRC) is building a naval base in Djibouti, which should be completed during 2017, alongside the already existing French and American military naval bases (“China’s base in Djibouti means more than an attribute of “global power”, Sputnik, 7/12/2016). This move is a crucial global development for China, for East Africa as well as for many other actors, which operations will be impacted, as we shall explain and detail further in this article. Djibouti is a small nation, strategically located at the tip of the “Horn of Africa” on the Bab el-Mandeb Strait between the Red Sea and the Gulf of Aden. Thus, it commands access to the Red Sea, the Sea of Arabia, the Indian Ocean and the Suez Canal, hence to the Mediterranean Sea. In other terms, it commands one of the most vital naval arteries in the world (Robert M. Shelala II, “Maritime Security in the Middle East and North Africa: a strategic assessment”, CSIS, 2014). Furthermore, since the reconstruction of the railway that connects Djibouti to Addis Ababa, financed by a Chinese bank and achieved by a Chinese company, the economically booming Ethiopia has access to the port, which attracts ships from the eastern coast of Africa. This favours numerous Ethiopia projects of transportation infrastructures’ development that extend to Cameroon through land transport infrastructures. However, pointing out the crucial importance of Djibouti as outlined above is not enough to fully understand the scope and strategic meaning of the Chinese base. To completely grasp the significance of this Chinese move, we must see it through the current Chinese lenses, notably incorporating the specific Chinese understanding and use of space as developed in the new “One Belt One Road” (OBOR) also called the “New Silk Road” (NSR) initiative. The NSR is a new expression of the Chinese philosophical and strategic thought, grounded in an understanding of the spatial dimension as something that may not only be used in order to support and spread Chinese influence and power, but also to allow the Middle Kingdom to “aspirate” or “suction” what it needs from the “outside” to the “inside” (Quynh Delaunay, Naissance de la Chine moderne, L’Empire du Milieu dans la globalisation, 2014). That is why we qualify spaces as being “useful”, while “useful spaces” are also related to other “useful spaces”. As a result, Djibouti, from a Chinese perspective, is not only meaningful as an access to Africa and a strategic position on the Bab el-Mandeb Strait, but also because it is “useful” at the scale of the African ambitions of the New Silk Road, a strategy devised by China in a time of worldwide competition for resources (Michael Klare, The Race for What’s Left, 2012). However, using the lenses of the paradoxical logic of strategy, we must also wonder if this Chinese strategy may not also become counter productive, because of the reliance it creates between China and a very unstable and fragile region, as we shall see in the last part. Djibouti attracts Chinese interest because it is not only a way in the transportation network of the Horn of Africa, but also and most probably foremost because, as a port, it is a complement to the maritime “use of space” as defined by the NSR (Deng Yaqing, “A shared path”, The Beijing Review, July 10, 2014). The Chinese base integrates Djibouti to the NSR strategy. 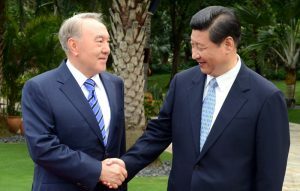 The latter became official in 2013 in Astana, the capital of Kazakhstan, when the Chinese President Xi Jinping launched the OBOR or NSR initiative (Michelle Witte, “Xi Jinping calls for regional cooperation via new Silk Road”, The Astana Times, 11 September 2013). This Chinese strategy is aimed at creating a planetary-wide “attraction system”, necessary to channel the mineral, energy, and food resources needed by China in order to keep developing itself while ensuring the social cohesion of its 1.400 billion strong population (Jean-Michel Valantin, “China and the New Silk Road, from oil wells to the Moon … and beyond!”, The Red Team Analysis Society, July 6, 2015. 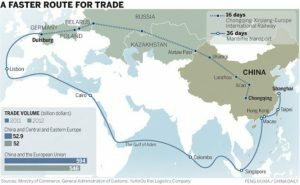 The Chinese NSR is implemented throughout Central Asia, Europe and Africa through a very specific use of space, grounded in the philosophy explained above: the different spaces where the NSR is created and located are segments of the same OBOR, upon which other segments are built (“Belt and Road Nations account for 26 per cent of China’s trade”, The Beijing Review, April 29, 2015). In the same time, building this base, while constructing the rail link to Addis Abeba is a way for China to support the development of Djibouti and of Ethiopia, and thus to help these countries becoming sustainable, hence “sustainable useful spaces” for China: i.e. spaces that will allow China continuing using them as nodes to provide resources from the external areas towards inner China (Valantin, “China and the New Silk Road, The Pakistani Strategy”, The Red (Team) Analysis Strategy, May 18, 2015). 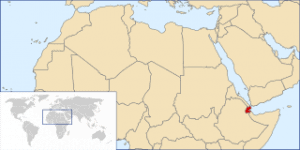 Djibouti, as seen, is located where the Red Sea, the Gulf of Aden, and through it the Arabian Sea and Indian Ocean, on the South, and the Suez Canal and the Mediterranean Sea, on the North, connect. 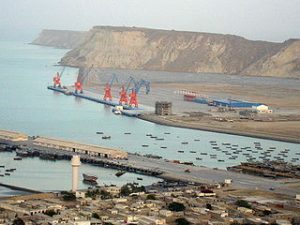 As such, this naval base defines a new segment of the OBOR through the connection it offers with the Pakistani port of Gwadar, largely renovated by China, on the opposite side of the Arabian Sea (“Pakistani PM welcomes first large Chinese shipment to Gwadar port”, Reuters, 13 November 2016). The maritime line between the two ports allows ships to sail along the coast of Oman and Yemen. the south-west coast of China and because it should also allow China to partly escape the bottleneck of the Malacca Strait. Indeed, it must be remembered that the port of Gwadar is currently being connected to the Chinese Xinjiang region, through the construction of an immense north-south highway across Pakistan (“Gwadar port integral to China maritime expansion”, The Express Tribune, February 17, 2013). 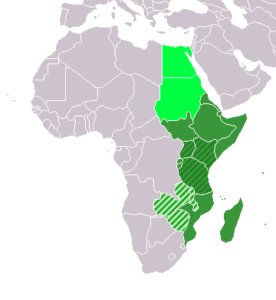 In other words, building a naval base in Djibouti and rebuilding the railway that connects the port with Addis Ababa in the hinterland of Ethiopia is a way to integrate the Ethiopian market to the maritime and terrestrial Africano-Asian transport infrastructure that goes from Eastern Africa and from the Horn of Africa to the economic zones of the South China coast and to the developing Xinjiang region. To this space strategy are aggregated other and more “classical” naval functions for the new base in Djibouti, such as the defence against pirates, coming from Yemen, Somalia, Eritrea, Sudan and Egypt (Jean-Michel Valantin, “Surviving the Gulf of Aden: a new strategic paradigm for the future of the region?”, The Red (Team) Analysis Society, November 11, 2013). 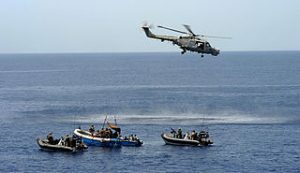 Participating in the international effort against piracy in the Red Sea and the Gulf of Aden is a way to confirm the status of China as an international power. This participation is also necessary, at a very practical level, in order to protect this segment of the NSR against the disruption that is being wrought by piracy (Valantin, “Somali Piracy: a model for tomorrow’s life in the Anthropocene?”, The Red (Team) Analysis Society, October 28, 2013), as well as by the international power games in the region, as “played” by Saudi Arabia, the U.A.E., Iran, the U.S., the Islamic State, and Al Qaeda for example in Yemen and Somalia (e.g. Hélène Lavoix, “At war against a global Islamic State – The fall into extreme Sunni Shi’ite tensions”, The Red (Team) Analysis Society, 1 February 2016). Thus, Djibouti appears as a particularly “useful space”, from the Chinese NSR perspective, because it is a strategic place to use in order to protect from the pirates and from ongoing war operations the ships and convoys, which are sailing to and from China, especially the oil tankers coming from the Arabian port of Jeddah. In the same time, it allows Chinese transportation and energy companies to have access to South Sudan and to its oil production (James Burgess, “War-torn South Sudan to resume oil production in July”, Oil Price.com, May 26, 2016). This “spatial usefulness” of Djibouti is magnified by analogous Chinese moves in Africa, for example much further south in the port of Maputo, Mozambique. In April 2016, The China Harbour Engineering Company has started planning to invest more than 1 billion dollars in a new port in the Maputo province, on the coast of the Mozambique capital. This operation is related to a South African-Swaziland project of railway linking Maputo to the mining zones in South Africa, through Swaziland, and is boosting building and renovation of transport infrastructures with Tanzania, Zambia and Botswana (“China’s CHEC involved in investment of US 1 Billion Dollars in the new port of Maputo”, Macau Hub, April 25th, 2016). The South African-Swaziland project could be used to transport coal to Maputo, and to export it to China and to India (“Bots SA coal, transport war”, The Patriot on Sunday, 10 August 2015). Thus, the Chinese Djibouti naval base, located on the north-eastern part of the continent becomes a space that opens different segments of the New Silk Road between South Asia and the Horn of Africa. In the same time, the Chinese interest in Maputo signals the Chinese interest in the southern part of East Africa and the preparation for the creation of the NSR segment necessary to connect China with resources it needs in south-east Africa (Shannon Tiezzi, “China’s “Maritime Silk Road”: don’t forget Africa”, The Diplomat, January 29, 2015). These East Africa-China connections create a practical transport system between the Chinese hinterland and the port-cities of the Chinese south coast and the African resources, which are necessary for the economic, industrial, consumerist and urban growth of China ,for example South African ore and fish from Mozambican fisheries (Craig Simon, The Devouring Dragon, 2013). The same dynamic will most probably facilitate inter-state exchanges by land and by sea within East Africa, which will attract even more resources and products to these harbour zones, and thus literally “plug” the different Eastern African areas with natural resources, or knowing economic growth, in the Chinese economic and resource needs (Dambisa Moyo, Winner take all, China’s race for resources and what it means for us, 2012). These so-far two East Africa segments of the OBOR is an international infrastructure through which China projects its “power of need”, i.e. the immense and permanent need for different kinds of resources and products necessary to answer to the basic and developing needs of a giant country with 1.4 billion people going through a triple cycle of economic growth, consumerism, and very rapid urbanization (Loretta Napoleoni, Maonomics, 2011). This means that the OBOR “initiative” is not mainly aimed at expanding a “Chinese hegemon” in the world, but to acquire the means, on an intercontinental scale, to make China sustainable, because the Middle Kingdom does not have the means to support this phase of its development by itself (Giovanni Arrighi, Adam Smith in Beijing, 2007). However, these “East African New Silk Road segments” must also be analysed through the perspective of the paradoxical logic of strategy (Edward Luttwak, Strategy, the logic of war and peace, 2002). Indeed, developing a project, be it political, commercial, military, or of any other nature, creates the emergence of situations that are driven by a paradoxical logic: the implementation of a given project attracts opposing forces, which threaten the very project that created or attracted them with failure (Luttwak, ibid). Understanding this attraction of the opposites and the necessity to use them in order to attain success is the very essence of the strategic approach, as we already saw in the case of the Russian Arctic (Jean-Michel Valantin, “Strategic thinking into the Russian Arctic: turning threats into opportunities, part 1 and 2”, The Red (Team) Analysis Society, January 9, 2017). In the case of the connection of the Chinese NSR with the ports of Djibouti and Maputo, the paradoxical logic of strategy is effective through the installation of the “Chinese power of need” in two regions that are alarmingly hammered by climate change, as well as by the combination of the climatic evolution with volatile political situations. In the case of Djibouti, the whole Horn of Africa is under a growing stress because of the combination of the effects of climate change on temperatures and precipitations with the human overuse of water as well as with multiple conflicts, as in neighbouring Somalia and Yemen (Peter Woodward, Crisis in the Horn of Africa, politics, piracy and the threat of terror, 2013). Over the coming years, the disruptive effects of climate change are going to keep building up and hammering the fragile and vulnerable Ethiopian, Eritrean, North and – South Sudanese, and Kenyan societies and economies, while the large hinterland of Djibouti is afflicted by international and civil wars (Serge Michailof, Africanistan, 2015 and François Guiziou, “Les ports de la façade est africaine : dynamiques d’intégrations et d’exclusions”, ISEMAR, Mars 2010). In the case of Mozambique, the Chinese quest for resources is reaching the African south coast of the Western Indian Ocean, where a mammoth climato-biological crisis may well be currently unfolding. A recent study shows that an alarming loss of more than 30% of the phytoplankton in the Western Indian Ocean took place over the last 16 years (Koll Roxy and al., “A reduction in marine primary productivity driven by rapid warming over the tropical Indian Ocean », 19 January 2016). This loss most certainly stems from the accelerated warming of the surface water, where the phytoplankton lives: the warming is blocking the mixing of the surface water with deeper and cooler subsurface waters, where the nutrients of the plankton – nitrates, phosphates and silicates – are located and where they remain blocked, thus depriving the plankton from its nutrients (K. S. Rajgopal, “Western Indian Ocean phytoplankton hit by warming”, The Hindu, 29 December 2015). The problem is that plankton is the foundation of the whole ocean food chain (Callum Roberts, The Ocean of life, the fate of Man and the Sea, 2012). For example, researchers have unveiled that there is a massive decline in the shoals of fish near the Kenyan and Somali coasts. These declines are not solely the results of overfishing, but of the combination of this practice with the loss of plankton (David Michel and Russel Sticklor, “Plenty of fish in the sea? Food security in the Indian Ocean”, The Diplomat, 24 August 2012). This negative trend is very likely to continue in the foreseeable future, because of the warming of the ocean resulting from climate change. 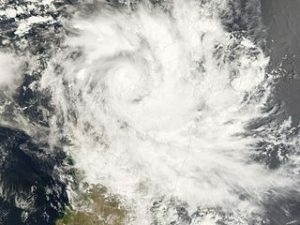 It is highly likely to alter the whole Indian Ocean, hence transforming the biologically rich ocean into an “ecological desert” (Amantha Perera, “Warmer Indian Ocean could be “ecological desert” scientists warn”, Reuters, 19 January 2016). This means that the decline of marine life stemming from anthropogenic climate change is a direct threat to the food security of the whole western Indian Ocean ecosystems, thus to the lives of the populations of Eastern African societies – i.e South Africa, Mozambique, Tanzania, Kenya, Somalia, Ethiopia, as well as archipelagos, as Comoros, Maldives, Seychelles, Madagascar, Mauritius, Mayotte – and to their economies (Johan Groeneveld, “The Western Indian Ocean as a source of food”, in WIO Regional state of coast report, UNEP, 1 May 2015). This is most likely to happen despite the rapid development of fish farming, which induces its own cascade of issues (Michel and Sticklor, ibid). Hence, a giant biodiversity and geophysical crisis is unfolding on such a scale that it concerns numerous countries and dozens of millions of people at the same time, while merging with political and strategic current crises. Then, the Chinese strategy of identification of and connection to “useful spaces” leading to the creation of segments of the OBOR in East Africa begs a question: are these spaces going to be really useful to help China answering its needs? In effect, the massive investments, which underlay these connections, will need time to produce a valuable return. This time to profitability may create vulnerabilities for China, because the need to find and import food ties the “Middle Kingdom” to the climate and biological crisis and the tangled geopolitics of what is becoming a very dangerous environment. In other words, we may wonder if China will have the necessary time to reap the benefits of these infrastructures built-in order to literally suction the resources needed for its own development or if it settles itself in a dependency on a region that could go through a massive environmental-social-political destabilization during the coming years. China does so through what appears to be a very efficient strategy, but which finally could turn against its creator. The African opportunities, which have attracted the creation of these segments of the “One Belt, One Road” could turn into dangers for the growth of China, should China not take also the adequate measures to ensure the ecological sustainability of these regions, assuming this is possible. Analytically, this situation exemplifies the crucial need to always integrate the new parameters emerging from the environmental, social and political impacts of climate change, as we continuously exemplify at the Red (Team) Analysis Society, in order to truly understand the present, how it is likely to unfold in the future and thus to devise a successful strategy across all time horizon. 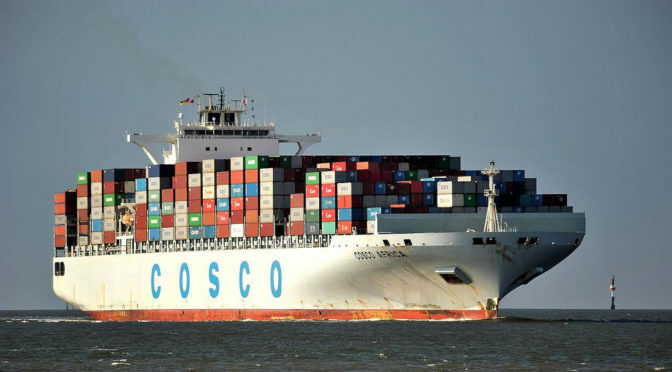 Featured image: COSCO Africa vor Cuxhaven, 11 August 2012 By Bernhard Fuchs (Flickr: Cosco Africa) [CC BY 2.0 ], via Wikimedia Commons.